and still ask for more." 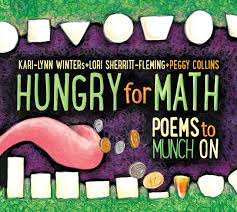 In their second poetic collaboration (following aRHYTHMetic, 2009), Ms. Winters and Ms. Sherritt-Fleming put the emphasis on math and number concepts that include shapes, patterns, counting, symmetry, estimating, and measuring time. It's full of fun with numbers and sure to please both teachers and their students with rousing rhythms and a connection to the math that is a part of everyday life. Patterns in the sounds of music, 2-D shapes seen everywhere we look, fifty rot-TEN dragons hiding in five groups of ten, and the symmetry in the shape of a bee are all incorporated into lively, rhythmic language sure to make enjoyable reading and learning in math class. Three circles, tall not wide. Six legs - three per side. Two plus two wings, on its back. Bands of yellow, white and black. Compound eyes to spy the view. Antennae, not one - always two. So, fire up the math and get munching.